The Art Of... Woodworking | The Art Of | Kids VT - small people, big ideas! On a recent Tuesday afternoon, a dozen kids sauntered into the gymnasium of the Winooski Educational Center and swapped their backpacks for safety goggles. For the next hour, the gym became a bustling woodshop. The din of hammers pounding nails echoed through the room. Sawdust piled up at kids' feet. 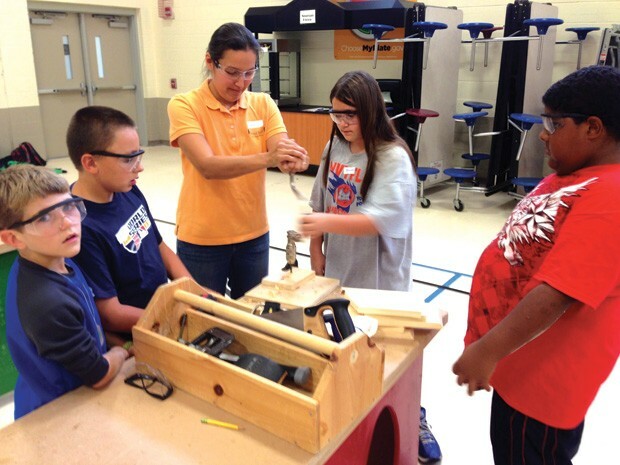 Hosted by the Winooski School District's 21st-Century Community Learning Center's after-school program, the class was led by Sawmill Studio, a portable woodworking program. Sawmill has a roster of roughly 40 projects for kids, but it offers just five at this program: a birdhouse, a flip-top box, a truck-shaped coin bank, a napkin holder and a multipurpose caddy. This is Winooski's third year working with Sawmill Studio, says Barb Russ, director of the 21st-Century program. She's been amazed by how immediately focused and engaged kids are when they get tools in their hands. During the third class of the fall session, JFK Elementary fourth grader Hunter Boulet was busy hammering a nail into his caddy. "I'm going to give it to my dad as a little gift," he explained. "He's always working hard, and he needs a tool box." Seventh grader Xavier Bouvier was completing the same project but planned to give it to his grandmother as a remote-control holder. This class was Bouvier's first foray into woodworking and he was having fun. "I like that they trust us to use tools," he said. Nearby, instructor Stuart Cheney helped a boy with his hammering technique. "Watch," Cheney said, raising the hammer up in the air with one hand. "You don't have to push down on the hammer with both hands. Lift it up and let the hammer do the work." The boy returned to his birdhouse with a newfound ease. Cheney, who studied industrial education at the University of Vermont, and coinstructor Sachi Hergesheimer, who has a degree in mechanical engineering, developed a friendship over their shared interest in woodworking while employed at IBM. Four years ago, they launched Sawmill Studio as a way to share the craft with kids. The instructors say they shy away from lecturing about technique and safety. Instead, they circulate while kids work, helping to troubleshoot when a nail goes in crooked or a board is cut too short. Pairs of students share a toolbox filled with small, good-quality adult tools — such as hammers and saws — and build with planks of furniture-grade pine cut into more manageable sizes by the instructors. A communal toolbox holds more specialized tools, such as hand drills and spokeshaves. Cheney and Hergesheimer custom-built eight brightly colored, collapsible workbenches that are just the right height for kids. Learning how to build things enhances kids' skills in geometry, measurement and problem solving, and also teaches them practical life skills. "It's good to be able to do minor repairs around your house, to hang pictures up in your apartment," Hergesheimer explains. Kids also gain confidence, the instructors say, from taking planks of wood and transforming them into something useful. That budding confidence was apparent in Winooski. Toward the end of the class, Boulet smoothed his toolbox with a sander and a spokeshave. "That's beautiful right there," he said, running his fingers along the wood. "Ah, yeah, that's nice. That's perfect." During the school year, Sawmill Studio offers classes for kids in conjunction with local schools and parks and recreation departments. For more information about locations, visit the Sawmill Studio Facebook page or email sawmillstudio@gmail.com.